Dolls, given the fact that the season of berry picking, sunshine, and pockets full of posies is upon us; I see no better way to pay tribute to the time of year dedicated to puddle jumping (courtesy of spur-of-the-moment rain storms), fun in the sun, and glamorous garden parties than via the incorporation of a bedazzling bauble perched upon your perkily-manicured finger. And that is precisely what one (1) of you lovely lambs has the chance to take home! By now I’m sure you’re all aware of where this is going, darlings; but since I’m incapable of keeping good news to myself, I’m going to share it with all of you…Café Fashionista has teamed up with Jewels of Denial to bring one (1) lucky reader a Rose Swarovski Crystal Rolling Ring. A rolling ring, also known as a trinity ring, consists of three individual rings that are locked together through interlinking the bands so that each ring can still rotate freely amongst the others. 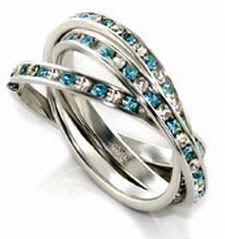 Due to their design, all three rings must be worn together at the same time. And you know me when it comes to sparkly pretties…the more the merrier! ♥For one (1) entry, leave a comment on this post between now and Thursday, April 8, 2010 at midnight PST. ♥For two (2) entries, Twitter about this giveaway, and leave a comment on this post between now and Thursday, April 8, 2010 at midnight PST with your Twitter URL. ♥For three (3) entries, become a follower of Café Fashionista on Blogger/Google Reader/Google Friend Connect/Twitter, and leave a comment on this post between now and Thursday, April 8, 2010 at midnight PST (if you are already a Café Fashionista follower, please say so in your comment). I will randomly pick one (1) name out of a hat (who knows, one of them could be yours! ), and announce the winners on Friday, April 9, 2010. This Giveaway is open to U.S., Canadian, and Australian residents! Thanks to Jewels of Denial for the picture. Wow, these are so pretty! What a fun give away! Ok so I twittered, I am already a follower and I am commenting...that's 3 for me right? LOVE LOVE LOVE NEED!!! LOVE this Rosie Trinity ring! I've never had one before - how fun! Of course I'm a CF follower! Oooh pretty, I'd love to win! Wow - great blog! I'm a first time visitor and love what I see so far. Please enter me! Oh my gracious - BEAUTIFUL!!!!!! Oh, and I'm a follower, of course!! Oh, too far away for the lovely rings. So no problem wishing everyone else GOOD LUCK! ... and happy Easter Days to you, Erika! I LOVE rings. They are really the only jewelry I wear! Whee! This ring is super cute and I'm always on the lookout for new rings. I'm one of those girls that's never without a few rings on her hand! I follow on Google reader and twittered about this @prblms4loki. Oh hahaha I follow through Google Reader. Didn't specify last time sorry! im already a follower :) omg! beautiful rings! they are SO pretty!!!!!! i would wear them everyday!!! Oh this is beautiful, please count me in! I am a follower! This is so beautiful please count me in! I am a follower! I absolutely adore your blog. I am an avid follower since January. I constantly find myself hanging on to your every word. These rings are so adorable. :) Rings are my all-time favorite jewelry. I wear at least 2 every day. I'd love a chance to win these. 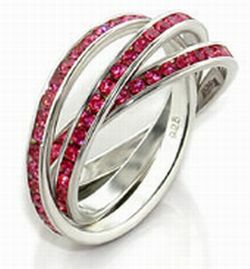 Wow, that is a gorgeous ring, I love it. Have a fabulous weekend! awh! how cool! the rings look so cute! i am also a follower of cafe fashionista on google friend connect and twitter! And, natch, I'm a follower! I love it! Everyone needs a fun ring like this! I already follow you through google but will tweet this too. So cute! that is a really pretty ring! those are GORGEOUS! i'm a follower, of course! Wow!! So pretty! What a great way to bring some colour into my wardrobe! Those rings are some of the cutest rings I've ever seen! Erika! !wow such a gorgeous giveaway!!! oo pick me pick me!! (don't worry, I still have a US address)! Gorgeous! The red would go so beautifully with my ruby engagement ring. I am definitely a blogger follower, my darling. I just adore rings! Absolutely gorgeous ring! Have a great weekend Erika! Beautiful ring! It's such a great style. What a great giveaway!!! Very pretty ring. I follow you via Google Friend Connect. entry #3! And, whoops, just realized that you aren't using Random.org. Sorry for the three comments. I follow you via Google Friend Connect. entry #2! I follow you via Google Friend Connect. entry #1! hello, thats gorgeous...I am also a follower. those are pretty. some lucky lady is going to be very happy. I am a follower of Cafe Fashionista! Wow! the ring is beautiful!! Please enter me! Gorgeous ring!! You always have the best giveaways! Hope youre doing fabulously! I'm a follower on Google and Twitter! http://twitter.com/lolatron/status/11516214131 Love the rings!! This blog always puts me in a good mood! That's gorgeous! And you're right - it seems perfect for the weather and the season. :) I'd love to give it a whirl! wanna take apart to win the giveaway but i'm so far away from u.. So pretty! But I expect nothing less from you! The trinity ring is very pretty! I really like the concept of these rings - it's awesome. Those rings are really beautiful! Oh wow Erika!! I really love these rings.. I've been wanting a trinit type ring for sooo long.. Have you seen the one by Cartier.. Oh so dreamy!! :) Count me in!!! You know I'm a follower. Wheee. These rings look really cool. I am a follower and tweeted about the giveaway. Pink crystals would totally match my pink engagement ring! Of course I'm a follower dearest! These are so gorgeous! I would love to have a set! Someone just asked me for a custom rolling ring...haven't decided if I'm going to do it yet. Wonderful giveaway and soo sparkley! I love the rose ones! inn for a chance to win. I agree, the more the better when it comes to sparklies! I am following via Google Friend Connect! oooh they are gorgeous! perfect for the spring! awesome giveaway. What a gorgeous ring! It's so delicate. I'm a follower on Reader. I am already a dedicated follower :), and I am tweeting as we speak (www.twitter.com/chicmommy1)! I love that trinity rings have the appearance of being stacked, but the simplicity of only donning one item. I hope I win! Oh, and I tweeted (twitter.com/puddingandpie) and I'm a follower on twitter and google already. These rings are gorgeous!! I am a fanatic with rings and bracelets, what an awesome find, thank you for the chance to win! these rings are adorable ! i would love to have them gracing my recently manicured hands. i started following you on twitter, and here is my twitter post ! ! ! these are so pretty ! i would love to have them gracing my recently manicured hands ! These are so pretty. I love how they sparkle. I follow you on Google friend connect/twitter/Google Reader.